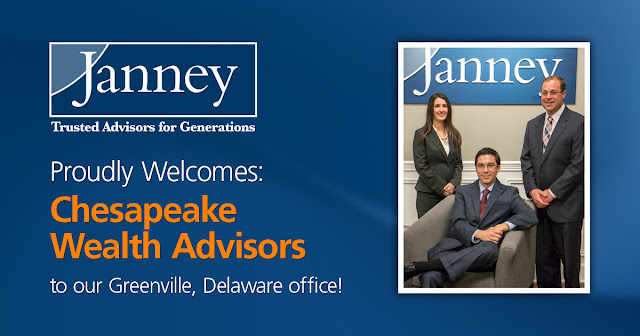 PHILADELPHIA, PA – April 4, 2016– Janney Montgomery Scott LLC (“Janney”), a leading full-service wealth management, financial services and investment banking firm headquartered in Philadelphia, PA, today announced that Michael D. Porter, Senior Vice President / Wealth Management, and Jeremy A. Lambert, First Vice President / Wealth Management, have joined Janney’s Greenville, DE branch office as Chesapeake Wealth Advisors of Janney Montgomery Scott. Michael Porter, a 16-year veteran of the financial services industry, and Jeremy Lambert join Janney from Morgan Stanley where they managed over $225 million in client assets. Rounding out the Chesapeake Wealth Advisors team are Heidi L.E. Jones, Registered Private Client Assistant, and Carmel A. Stephano, Private Client Assistant. 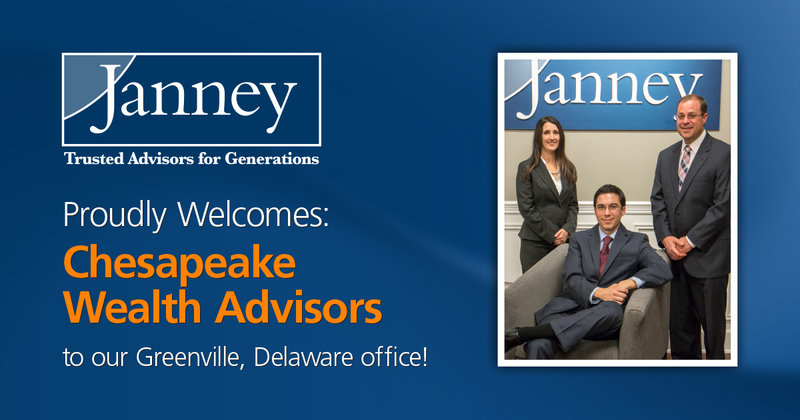 “On behalf of Janney, I am very pleased to welcome Chesapeake Wealth Advisors to Janney’s Greenville branch office as they are a very experienced team of financial advisors with a proven track record of providing outstanding customer service and thoughtful investment advice,” said Vince Crognale, Greenville, DE Branch Office Manager.